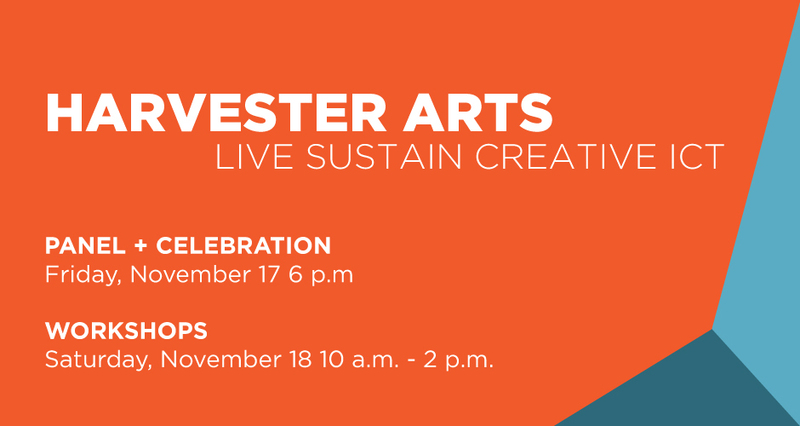 The Arts Council is a proud sponsor of Live Sustain Creative ICT at Harvester Arts. This two-day event will be held on Friday, November 17th and Saturday, November 18th. Have your voice heard while discussing how you live and sustain a creative life, what impact this has on our community, and what we can do to make our community strong. Visiting artists and contributors to Sharon Louden’s book, The Artist As Cultural Producer: Living and Sustaining a Creative Life, will act as catalysts to the local community during conversations about the role artists play in community. The event kicks off with a panel discussion, community conversation, and a book launch. Local and visiting artists from across the country will discuss how artists live, thrive, and tackle challenges. All visiting artists are contributors to Sharon Louden’s book The Artist As Cultural Producer: Living and Sustaining a Creative Life. Sharon Louden is an artist and author, as well as consultant with Creative Capital and the Joan Mitchell Foundation. Her book encompasses a collection of essays from artists and art organizations across the country. Copies of the book will be available for sale at the event. Choose a morning workshop, and get your tickets via Eventbrite. The afternoon session and lunch are included. Drawing from the visiting artists’ as organizers in their own communities, this workshop will contract their experiences with those of creative organizers in Wichita. Together, they will identify strengths and challenges of this type of work. Drawing from the visiting artists’ experience sustaining creative lives in their own communities, this workshop will contrast their experiences with those of artists in Wichita. Together, they will identify strengths and challenges of this type of lifestyle. Workshop participants will come together, lead by local organizers and artists to compile strengths and challenges for organizations and individual artists in Wichita. Participants will outline an action plan to address challenges. CityArts will host the opening of the Arts Council Juried Exhibition from 6-8 p.m. Friday, Oct. 27 in the CityArts Main Gallery, 334 N. Mead, in Old Town Square. The exhibition will be on view through Nov. 9. Admission is free to view the galleries at CityArts during regular business hours: 9 a.m.-9 p.m. Monday–Thursday, 9 a.m.-5 p.m. Friday and 9 a.m.-3 p.m. Saturday. The Arts Council Juried Exhibition is an annual visual art exhibition sponsored by The Arts Council and hosted by CityArts. Artists ages 18 and older from Kansas are invited to submit their work for consideration into the exhibition. Guest artists anonymously select pieces to be in the exhibition. This year, 111 artists submitted 475 pieces of art for consideration. This year’s jurors, Kristen Beal and Kate Van Steenhuyse, co-owners of Harvester Arts, selected 66 pieces of artwork by 44 artists for the exhibition. For more information, visit wichitacityarts.org. 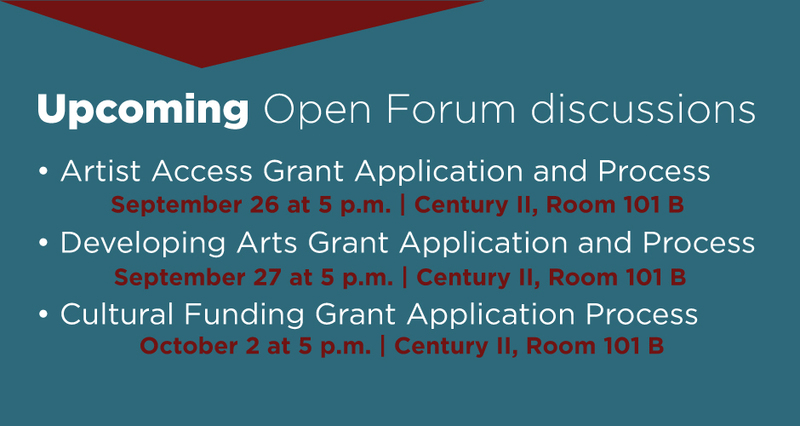 Please join the Arts Council for Open Forum discussions over the following weeks. Tuesday, September 26, 2017, 5:00 p.m. – 6:30 p.m.
Wednesday, September 27, 2017, 5:00 p.m. – 6:30 p.m.
Monday, October 2, 2017, 5:00 p.m. – 6:30 p.m. If you have any questions, feel free to call or email Bernadette Bradshaw, bbradshaw@wichita.gov or call 316-303-8663. We hope to see you there!